Plastic pails are everywhere, even if you don’t notice them. They’re used for everything, and that’s because they’re good for everything. If anyone’s told you otherwise, they’re spreading disinformation. Here are twenty other bits and pieces of myth and made-up we’ve heard over the years, and we’re here to air them out and let you know what the real deal is with them. Pails are actually very varied in what they can do and what they’re made for. Even among pails made to carry the same substance, some are better suited for your needs than others. Take a look at what you need, then decide accordingly. Not true, even in the slightest. They might be a little pickier about how to be recycled, but they can be recycled. Some are special though, like those made with food-grade plastic, and are made of special plastics. These should be recycled appropriately to be remade into something using that same kind of plastic. Continuing on, let’s talk about the plastics that make them nit-picky when recycling time comes. Recyclable plastics are marked with a number from 1 to 7 somewhere on them, and that will tell you how they should be recycled. It indicates what they’re good for and what kind of plastic they’re made from. Although there are many different types of pails, it doesn’t mean that there’s only one for each kind of use. Pails that are food-grade can just as easily be used to contain sand, cement mix, cutlery, and a number of other objects. Just maybe don’t use them for food again. Plastic pails are so usable that their lifetimes are practically infinite. If you don’t want to recycle and you want to keep using the pail, but it’s lost its ability to contain things, there are a hundred different things it can be used for instead. Kid’s projects, decoration, molds, and toys are just a few options, but there are hundreds out there. While it’s true you shouldn’t reuse food grade plastic pails after storing unsafe materials in them, plastic pails have no problem handling multiple uses for multiple things. If yesterday the pail was containing meat, just wash it out and fill it with dairy if you need to. Or use it to store your catch from a fishing trip. Don’t be shy, it can handle it. Obviously, however, cross-contamination isn’t always the best thing. If you store hazardous materials in your plastic pail (which it absolutely can handle) make sure to never use it for food again. You can never be too safe, and if the residue in there is enough to hurt someone and get regulators in your business, you can bet that there’s enough residue in there to be found by professionals who know where to look when checking for health breaches. While they are certainly great for storing food both professionally and for picnics, they can handle a lot more and in fact are being under-utilized if they aren’t. Make the most out of your money. This is also very untrue. Plastic pails are very versatile, which is what makes them so great. Not all of them are food-friendly, but just check the markings and they’ll let you know which are safe and which aren’t. Speaking of markings, get to know what they mean. There’ll be pictures and numbers and each mean something, and if you want to make sure you’re storing everything the right way you’ll want to get to know these ASAP. Given everything we’ve said so far, there’s no way you can still believe this. Plastic pails are the reconditioned steel drums of the plastic container world, and what’s better: they come with handles. We wouldn’t say difficult, but you do need to take special care with them. It’s not difficult by the standards of what difficult is supposed to mean, but you will have to take them to a special facility that’ll sort them specially by their plastic composition. Not true either. In fact, plastic pails (when treated right) are never thrown out. They are easily recyclable and usable for other purposes when their intended use runs their course. There are even plastic pails that are made to be biodegradable. Plastic pails stack into each other. That right there is all we need to say. You can stack ten pails together to take the space of two. Depends on what you’re storing, but normally it’s very easy. Plastic pails are made to not carry over the residue of they had in them before, and as such, it makes it really easy to wipe them clean. Just do it before the gunk hardens. Plastic pails are perfect whether you’re working in a hot construction yard or need to hold some cream in the freezer. They are flexible, durable, and they are more than capable of handling all bounds of reasonable temperatures. Clearly you don’t want to throw them in a fire, but they’ll hold anything from ice cream to boiling coffee for you. Many people believe that plastic pails are not up for the job when it comes to grittier work, but that’s just a myth. In fact, if you drive by a construction yard, you’re sure to see no shortage of them yourself. They’re the pail that keeps on pailing. Manufacturers will make customized pails for you, and they will even provide the lids. Just tell them what you want and it’ll get made for you. Where do you think all of those markings are coming from? Those markings are there because of certifications and regulations, and someone went through a lot of trouble to put them there so appreciate them. 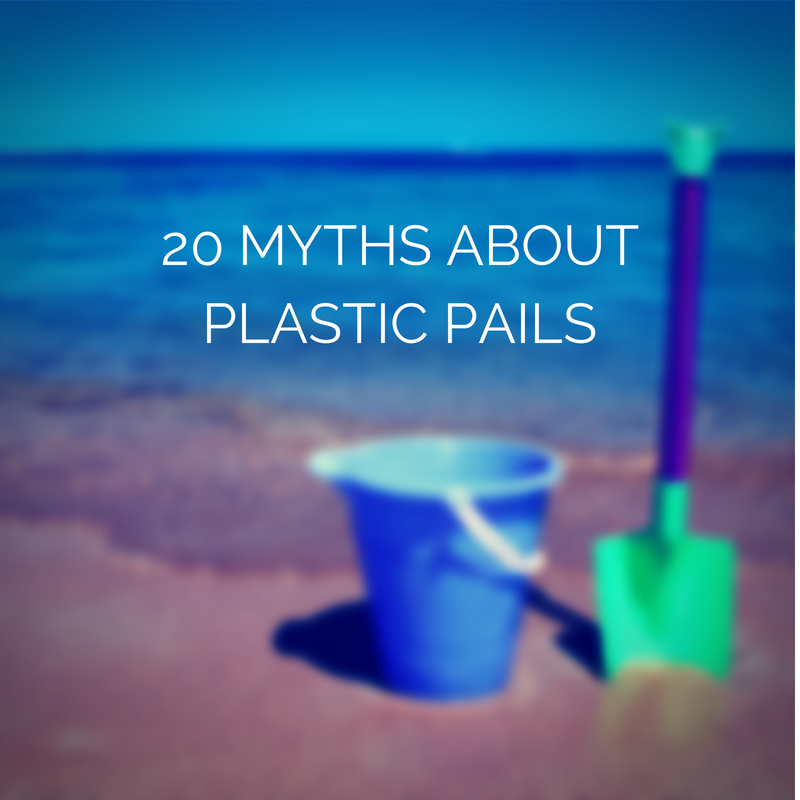 Learn EXACTLY what you want to use a plastic pail for before you get it. It’s not enough to say “I want to transport chilled meat;” you have to know what condition you want the meat to be in when it gets to its location. I mean no matter what, it’ll end up where it needs to be and the pail will protect it, but what if you want the meat to keep its rosy red color rather than turn purplish from lack of oxygen? There are pails that’ll do that for you and there are pails that won’t, and both are food grade. Pails are incredibly versatile, but as with all things versatile it means there’s a lot you have to learn about them. If you learn how to read the markings and know what pails are good for what purpose, there is no myth that can be told without you being able to debunk it yourself. Plant Manager – Edmonton, AB.